We enjoy finding out-of-the-way and rural surprises. There is so much American history down dirt roads and backroads! Take a backroads trip down Highway 55 to Bollinger Mill Historic Site in Missouri! This mill is four stories high and was the center of the settlements nearby. 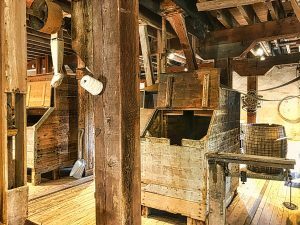 Early in our country’s history, towns grew up around water-powered mills. 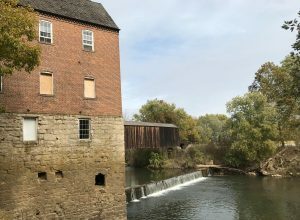 The Bollinger Mill dates back to the Civil War era in Missouri when corn and wheat were ground into flour and meal. In 1800, George Frederick Bollinger built both a log dam and the mill bearing his name on the Whitewater River in Missouri. By 1820, a road linked Bollinger Mill with surrounding towns. In 1825, Bollinger rebuilt the dam and mill using limestone. 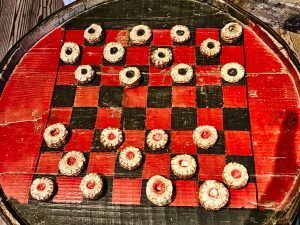 Bollinger died in 1842 and his daughter took over operating the mill until the Civil War, when the mill was burned by the Union Army so that any supply of flour and meal was cut off from the Confederate Army. After the war, the mill was rebuilt in 1867 using the original foundation. The 1867 building is what can be seen today and beautiful. The Missouri town of Bufordville was founded at this time. Solomon Burford owned the mill until 1897, when the Cape County Milling Company took over the property. The company operated the mill until 1953. In 1961, the mill was donated to the Cape Girardeau County Historical Society. It is now a National Historic Site. 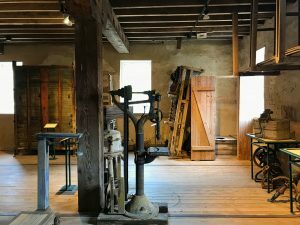 Though the mill does not operate today and is a Missouri State Historic Site, mill artifacts are still inside. Visitors can view both the bottom and first floors for free. The second, third and fourth floors are $5.00 per person (2018). 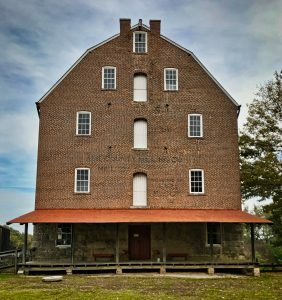 Rangers and tour guides are available at the mill to educate visitors about its history and use. We just walked through on our own and really enjoyed the rural setting. The mill stands next to the oldest covered bridge remaining in Missouri and is a fantastic hiking and picnic spot. Visit this beautiful and peaceful rural treasure when next in Missouri!